The Heirloom Registry™ Scavenger Hunt, hosted by Houstory®, ended last week. Four lucky winners from Illinois, Arkansas, New York and Missouri took home family history, genealogy and antique prize packages collectively valued at more than $500. 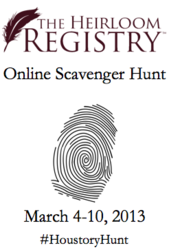 The scavenger hunt helped folks understand a little bit more about the value of The Heirloom Registry and its role in preserving and sharing family history. The Heirloom Registry™ Scavenger Hunt, hosted by Houstory®, ended last week. Winners from Illinois, Arkansas, New York and Missouri took home four, family history, genealogy and antique prize packages collectively valued at more than $500. Contestants were required to visit each of the various partner blogs to collect codes that could be entered into The Heirloom Registry to locate hidden clues. The week-long event involved 11 sponsor blogs and three separate hunts. 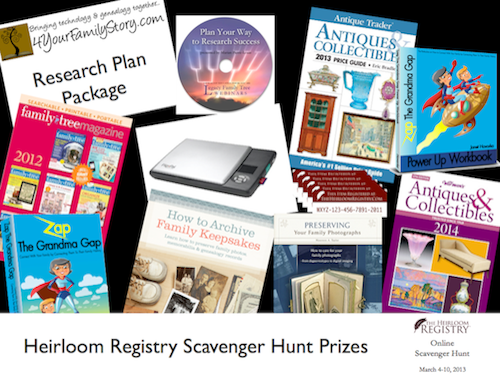 The following scavenger hunters were awarded prize packages that included a variety of genealogy, family history and antique-related products. Kimberly Nagy of Downers Grove, Ill.
Caroline Shultz of Sherwood, Ark. Deb Andersland of Gainesville, Mo. was named the grand prize winner of the event. Her prize package included a Flip-Pal® mobile scanner. The Heirloom Registry is a new service from Houstory. Record a family heirloom’s history in The Heirloom Registry, and its story travels with it. Always. Inexpensive, simple: Tag heirlooms with Registry IDs, and share stories in words and pictures at http://www.heirloomregistry.com. Registered stories are permanently accessible to future owners.